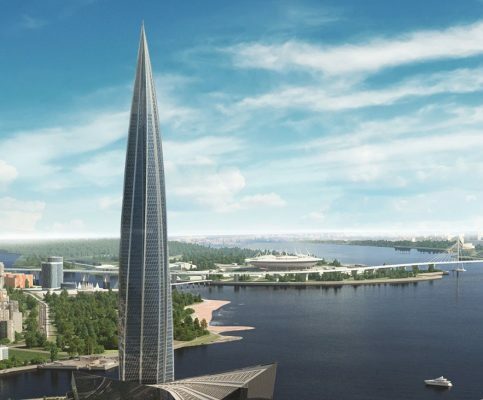 The Lakhta Center Tower, the construction of which was completed this year in St. Petersburg, awarded LEED® Platinum certification according to the results of the assessment of the environmental performance criteria. The Lakhta Center Tower scored 82 points, which corresponds to the highest Platinum level. It should be reminded that at the design and construction stage the complex was pre-certified according to the LEED Gold standard. However, during the project implementation period, a number of parameters were improved, in particular, the indicators of transport accessibility and the quality of the internal environment were improved, the number of bicycle parking lots was increased and additional infrastructure for those coming to work by bikes was worked out; the absence of a negative impact on the environment was proved due to the treatment facilities for surface runoff from the territory; the target level of energy efficiency of buildings was increased, including through the use of cold accumulators. 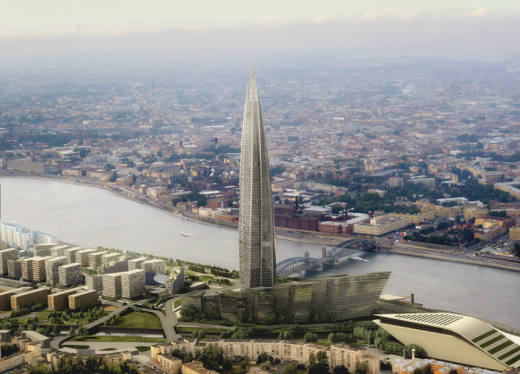 The Lakhta Center Tower scored 10 points out of 10 possible for some credits, such as water efficiency and regional priorities. Lakhta Center Chief Engineer Sergey Nikiforov: “For us, obtaining an international environmental certificate of the highest status is another confirmation of the fact that the project was implemented in full accordance with the original idea – as the flagship of high technology, environmental friendliness and comfort. It is extremely important for us that the maximum possible indicators be achieved precisely by the quality criteria of the internal environment, in particular, by maximizing the use of natural lighting – more than 75% of workplaces with sufficient daylight”. Lakhta Center is a multifunctional complex in Saint Petersburg which houses the headquarters of Gazprom Group and public spaces that occupy about a third of its area. The construction was completed in October 2018, at the moment finishing and furnishing works in the business and public areas are in progress. The construction of the complex lasted 6 years, from October 2012 to October 2018. 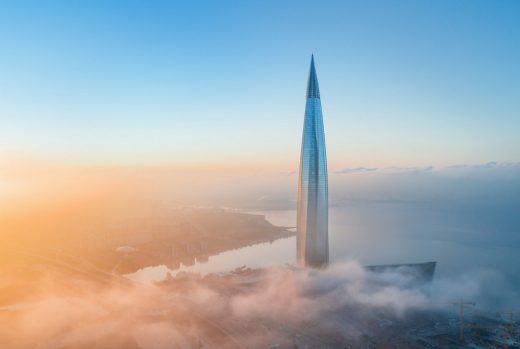 The architectural dominant of Lakhta Center – a 462-meter (1516 ft) skyscraper – has become the Europe’s tallest building. About 600 Russian and foreign companies and more than 20,000 people from 18 countries took part in the project implementation. An 87-storey skyscraper twisted at 90 degrees from foundation to top in accordance with the complex geometry and architecture of the building. An arch that is a stand-alone building-entrance to the complex. A stylobate that hides the parking, the warehouses, and the logistics passages. For the LEED standard, a 100-point rating system has been developed for five main categories: environmental friendliness of the construction site; efficient water consumption; energy and environment; materials and resources; environmental quality in the premises; plus additional points for innovation and design, as well as for regional priority. Each of the categories reviewed by experts provides its own points system and assesses the degree of the implementation of green construction principles in a relevant area. By the amount of points, a Facility is awarded one of four levels of the certificate: Certified — 40-49 points, Silver — 50-59, Gold — 60-79, and Platinum — 80+ points. Today, LEED is the foundation for creating healthy, highly efficient, and economical green buildings. This is the most widely used green building rating system in the world: 98,690 projects in 165 countries. In Russia, only two projects are LEED Platinum certified: Renaissance Business Park in St. Petersburg, 6 Smolyachkova Street (its area is 25,625 sq. m) and the new part of L’Oréal plant (13,700 sq. m) in the territory of Vorsino Industrial Park in the Kaluga Region. Vittorio Veneto, June 20th, 2018 – The Lakhta Center in St. Petersburg offers spectacular views on the adjacent Saint Petersburg Stadium, one of the stadiums used during the FIFA World Cup. With its height of 462 meters, the building is the tallest skyscraper in Europe. In time for the FIFA World Cup, and supported by experienced alpinists, the Permasteelisa Group has completed the installation of all the glass panels of the tower. The double skin façade has been designed and produced by Josef Gartner GmbH, the German subsidiary of the Permasteelisa Group. The curved façade comprises an overall area of around 14 football pitches – an area exceeding the sum of all football pitches of the Russian Word Cup stadiums. 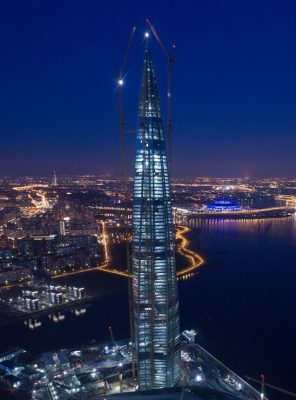 At a height of more than 300 meters, the latest installed glass panels on the Lakhta Center have been those necessary to close the remaining open parts of the outer building envelope where the tower crane had been fixed. Unlike the other prefabricated façade units, these glass panels had to be pressed onto the curved aluminum frame from the outside. A very complex that required the support of skilled alpinists on the rope. In January, Gartner had already installed the 13 metres high stainless steel tower spire. The new landmark of St. Petersburg is located ten kilometers from the city center, with an air-line distance of only three kilometers to the new World Cup stadium. It is expected to become the heart of a new City thus providing relief to the historical center. In addition to the Observation Deck, the building complex also offers cafes & restaurants as well as cultural & exhibition facilities. 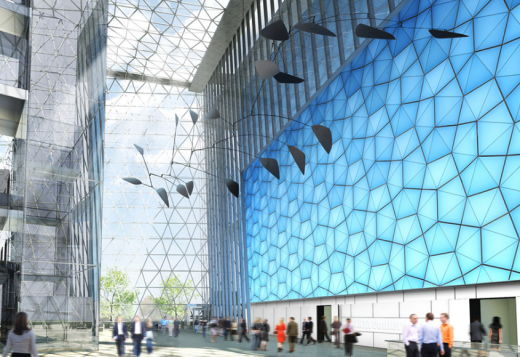 The office tower, with a gross area of 163.000 sqm, will accommodate the headquarters of the Gazprom Group. Like a needle, the Lakhta Center elegantly spirals up into the sky. 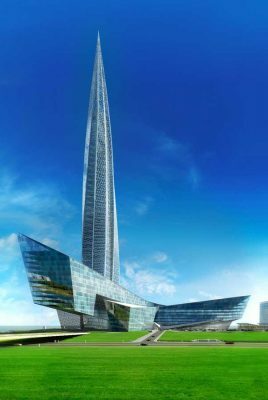 Around half-height the tower, which has been designed by the Moscow architects ZAO Gorprojekt, reaches its maximum width and then tapers into a spire-shape. The floor plan of the building resembles a five-pointed star. As the floor slabs are twisted towards each other, the tower winds upwards by 0,89 degrees each floor. Nevertheless, the tower seems to uniformly spiral toward the sky. Such effect can be achieved with cold formed glass façades. 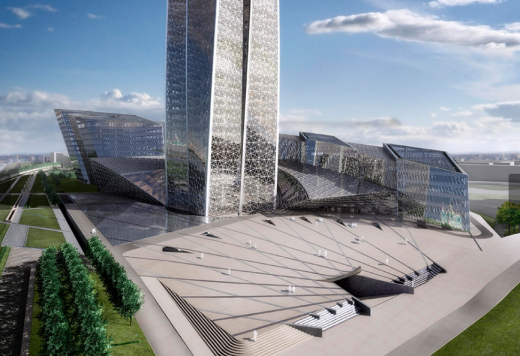 The façade of the Lakhta Center has got a total façade area of 100,000 sqm with unit sizes of 2,8 x 4,2 m that gives the skyscraper a very high degree of transparency. At the lower floor levels, the façade is inclined outwards while the upper levels are inclined inwards. For the cold bent glass panels, the planar glass panes have been cold-bent by 40 millimeters at one corner in the frame yielding a flat twisted glass surface that creates an elegant twist of the façade at each floor level as well as uniform reflections. At each of the five exterior edges of the building, glazed atria span over two storeys offering naturally ventilated lounge areas with openable wings integrated in the corner units of the tower. This makes Lakhta Center one of the tallest naturally ventilated skyscrapers worldwide. In winter, the atria serve as a heat buffer and, together with other energy-saving technologies the tower has become a Green Building which is pre-certified under LEED Gold (International Leadership in Energy and Environmental Design system). Location: Lakhta, St Petersburg, North Western Russia – on coast of the Gulf of Finland. Europe’s tallest tower has topped out at 87 storeys. The colossal 330,000 m²development is by British architects RMJM.